At about 4am this Saturday, January 25, 2014 there will be a shift in the universe. You might not feel is where you live, and it might not be the lead story on the news radio station, but I will tweet about it. The fact will cause a stir! For the first time in 22 years I will turn on my oven. Saturday is Robbie Burns Day. And I will be heating two rather large haggis for the SFU Centre for Scottish Studies “3rd Annual Robbie Burns Day Marathon Reading.” We plan on breaking the world record for the “longest continual recitation of Burns’ poetry and song.” Our goal is 6 hours. We will prevail. I created this crazy event and it’s my job to make it happen. This entails coordinating all the participants, promoting it everywhere and to everyone, and basically taking care of all the bits and pieces. That’s where the haggis comes in. People expect to eat haggis on Robbie’s day and I better deliver some… and it better be hot! My favourite part of the event is chatting with all the people. Everyone seems to have a story to tell about the poem or song they want to recite. Everyone wants to share their thoughts. And so often, someone has a story that will break your heart. Voices have cracked and tears have flowed. I’ve spent hours on the phone not just booking a time slot for the marathon, but hearing the detailed background of treasured memories. I’ve discovered Burns and his words have the power to evoke strong emotions. I hear about “a mother, long gone, and her favourite poem”, “a song heard while looking out over a glen” and even a book passed on through generations. I hear about glorious parties from years ago… and intimate whispers of souls not forgotten. 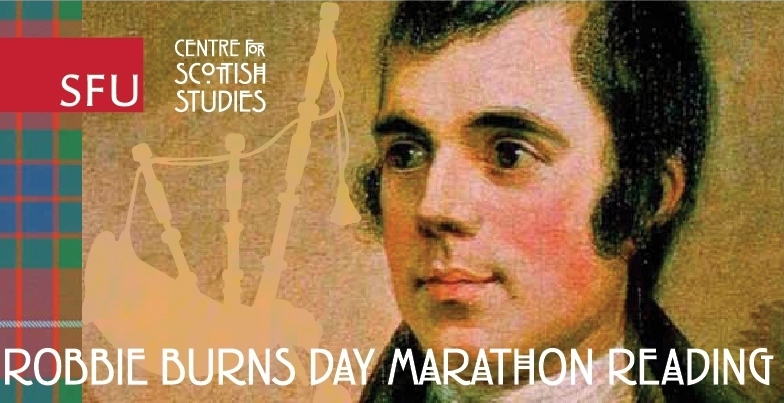 This event started as a vehicle to promote the Centre for Scottish Studies. Little did I know I would come face-to-face with the power of the written word. Robert Burns deserves this day… we need to celebrate him. And who else would have the clout to get me to turn on my oven. It is a miracle. Luckily I enjoy a good haggis. So fine, Tricia. So fine. I will stand back after my ten or so minutes at the podium and enjoy my chieftain o’ the puddin’ race more now because I will know it was done to a turn in your own oven.